Introduction: It’s a new mission for a new year. New stars are in the skies, and it’s the perfect time to start exploring the heavens–for the first time if you’re new to this, or exploring it again if you’re an old hand. This mission requires no prior knowledge, experience, or equipment; it’s just about getting out and getting acquainted with the night sky. Instructions: Go outside after dark, face southeast, and find three stars in a straight, vertical line. These are the stars of Orion’s belt. They are flanked on either side by twin bright stars of roughly equal brightness but different color. On the left is Betelgeuse, an enormous red giant that appears yellow to the naked eye. On the right is Rigel, a blue-white supergiant. Follow the line made by the belt stars down to even brighter Sirius. Sirius is the brightest star in Earthly skies, but it’s a not a giant or supergiant like Betelgeuse and Rigel. In fact, Sirius is a main-sequence star, a little less than twice the diameter of the sun, but about 26 times as bright. By comparison, Rigel is about 40,000 times as bright as the sun. But Rigel is 773 light years away, whereas Sirius is only 8.6 light years from us–the fifth closest stellar system to our own. Sirius, the Dog Star, is the chief star in the constellation Canis Major. From Sirius, hang a right-angle left turn and head on to Procyon, “before the dog”, so named because it rises just a few minutes before Sirius from mid-northern latitudes. The small and otherwise dim constellation Canis Minor has little else to recommend it, and Procyon serves mainly as a celestial landmark. Farther left still, and farther up in the sky, are the twins, Castor and Pollux, at the head of the constellation Gemini. If you have trouble keeping them straight, remember that “Castor is close to Capella, but Pollux is in proximity to Procyon”. Speaking of Capella, it’s the very bright star directly toward the zenith from Castor and Pollux. It’s a brilliant gem in a ring of prominent stars that mark out the constellation Auriga, the Charioteer (this is not the big ring marked in red on the diagram above, but the much smaller blue-white ring on the upper left). To the right of Capella is Aldebaran, the burning red eye of Taurus, the Bull. Aldebaran means “the follower”, because this star rises after the Pleiades, which it appears to chase from horizon to horizon (to trace that line, see the previous mission). Aldebaran is an orange giant, meaning that it has exhausted the hydrogen in its core and moved off the main sequence. Without the outward pressure of radiation from hydrogen fusion to prop it up, the core of the star is compacting under gravity and heating up. When it gets hot and dense enough to start fusing helium, Aldebaran will bloat into an immense red giant, like its neighbor, Betelgeuse. And speaking of Betelgeuse, it lies in the middle of the great circle described by Rigel, Sirius, Procyon, Castor and Pollux, Capella, and Aldebaran. I call it the Ring of Fire–nowhere else in the northern sky is there an equal concentration of bright stars. 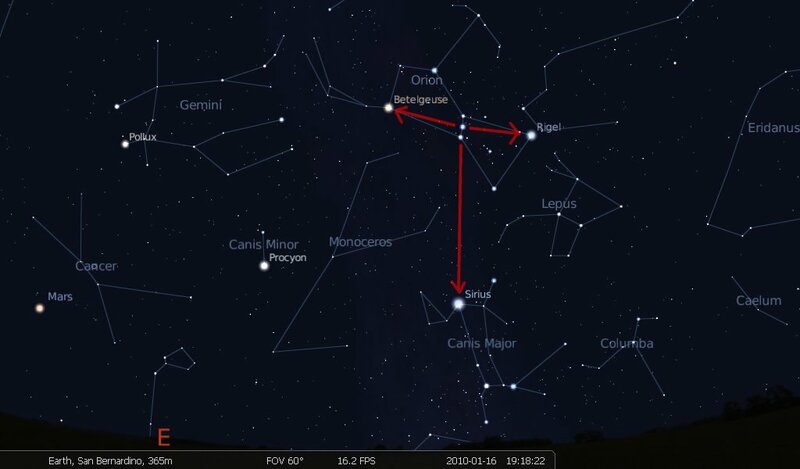 Below and to the left (east and north) of the Ring of Fire is Mars, which will be at opposition–opposite the sun, and at its closest approach to Earth–in a couple of weeks. The orbit of Mars is more elliptical than that of Earth, and this will not be one of the better oppositions, but it’s still the best look at the red planet that we’ll get for another two years. What’s next? This mission was just a lightning run through the bright stars of winter. Their respective constellations are packed full of beautiful targets for binoculars and telescopes, and we’ll look at some of those in future missions. 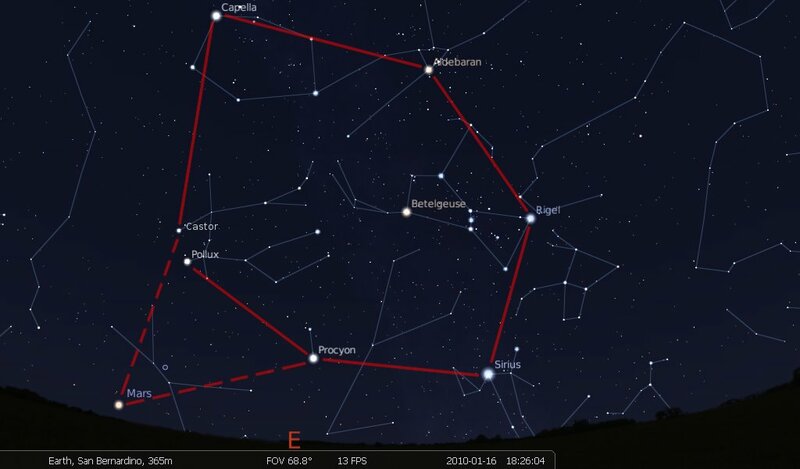 If you’re impatient to get started, download this month’s The Evening Sky Map, haul out your optics, and happy hunting! “Castor is close to Capella, but Pollux is in proximity to Procyon”. THANK YOU for that! That is sooo easy to remember, I’ll never get them confused again. Ha, you’re welcome. I’m pretty sure I got it from Uncle Rod. I use it all the time myself, most recently at the All-Arizona Star Party when I hadn’t seen C&P for a few months and couldn’t remember who was who.